After yesterday's trailer piqued our curiosity, Namco Bandai delivers more details on Assault Horizon, a game being called a "complete rebirth" for the Ace Combat franchise, or "steel carnage in the sky." According to today's press release, Project Aces has always wanted more out of the Ace Combat series. They wanted a game that not only told a compelling story, but also presented the most visceral aerial combat possible, with deadly combat pilots weaving between the buildings of real-world cities, bits of their planes breaking off as they cut a turn too close, shattering into pieces as oil sprays all the way across the sky, perhaps forming a double rainbow. 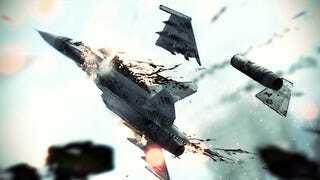 "For us, this is a rebirth of the Ace Combat series, and a chance for us to take the series in a completely new direction," said Kazutoki Kono, Producer at Project Aces, NAMCO BANDAI Games Inc. "We're confident that we're going to create a new kind of action shooting (high-speed and destruction) experience with ACE COMBAT ASSAULT HORIZON, and we're pouring passion, vision and skill into making a game like no other. We want to bring players closer than ever to the action so they feel the energy surge through them with every shot fired." Sounds good to me, and it's got the looks to back it up.